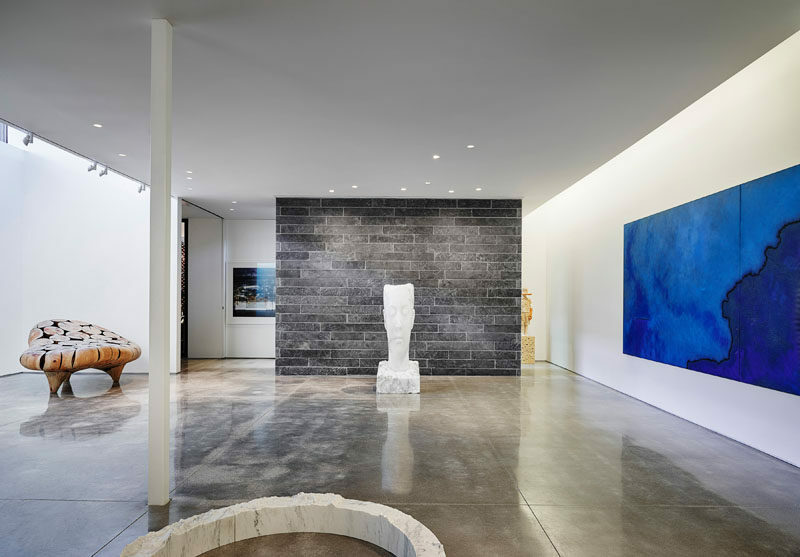 Architecture and interior design firm Hufft, have completed a new house in Kansas City, Missouri, that’s been designed for a couple that have a large art collection. 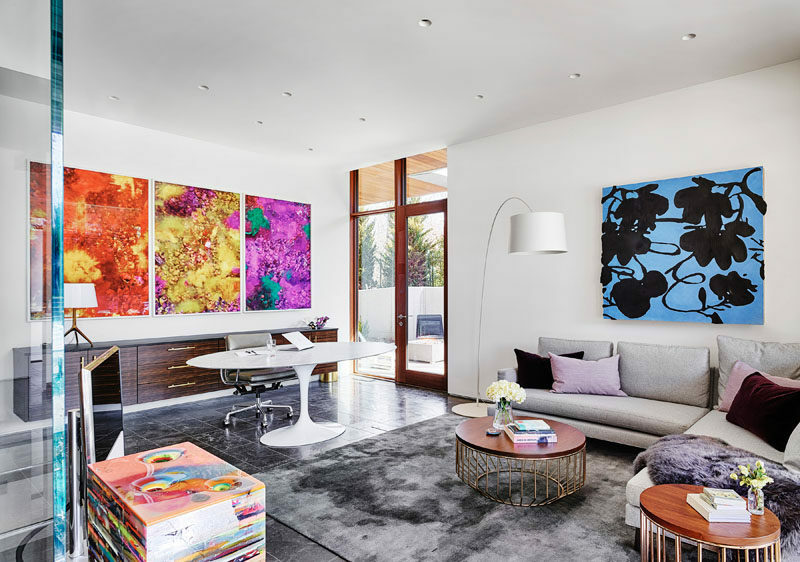 A large pivoting wood doors greets people as they arrive to the home, and is immediately apparent that the home is filled with art pieces. The main floor of the home is dedicated to the social areas. 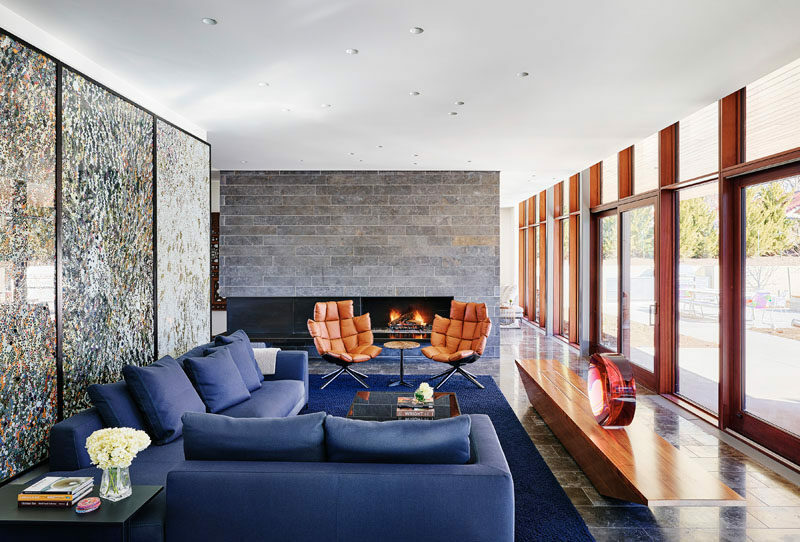 In the living room, large artwork becomes the backdrop for the blue couch, while floor-to-ceiling windows provide ample natural light. Beside the living room is the kitchen. Dark wood cabinetry has been paired with lighter wood accents, while a long kitchen island is positioned centrally in the space. 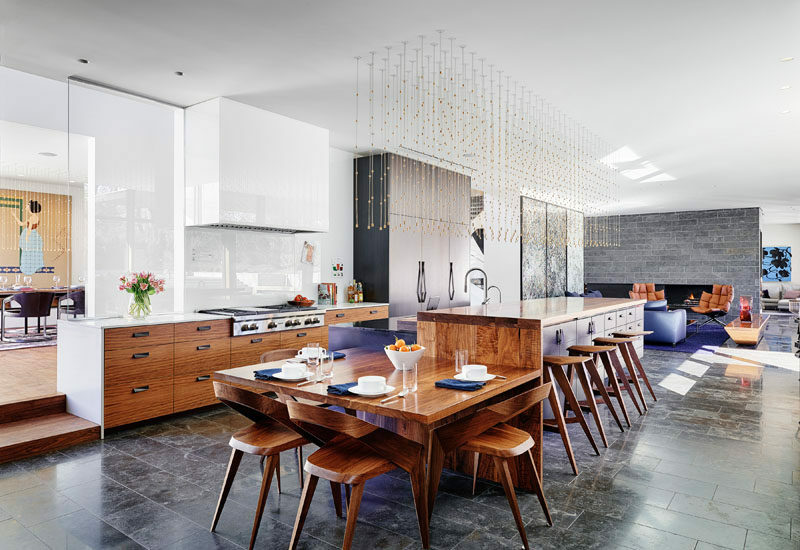 Above the island is a decorative light installation that brightens the kitchen. There’s a small casual dining area attached to the end of the kitchen island, while behind the kitchen and on the other side of the hallway, is a formal dining room. Down the hallway, there are two home offices. 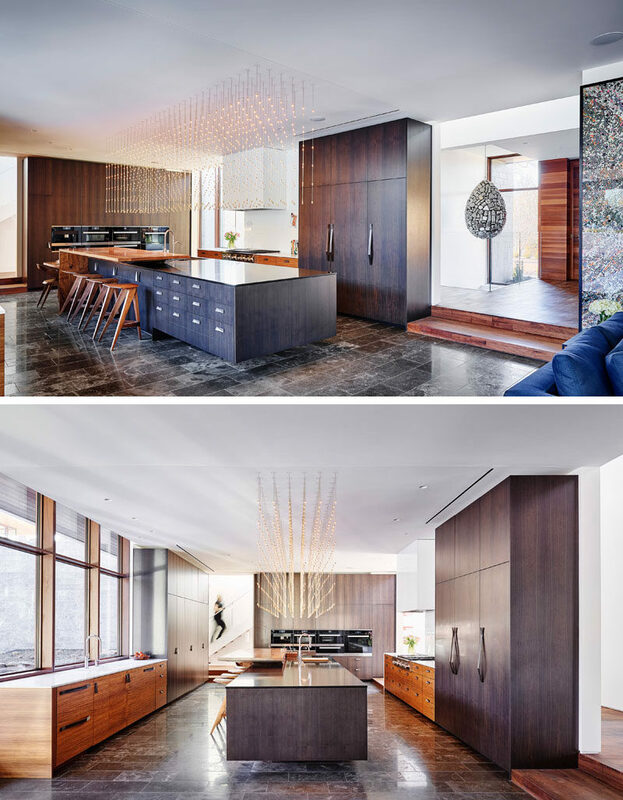 The first features a sliding wall, that when opened, reveals a wet bar with dark cabinetry. Here’a closer look at the wet bar hidden behind the sliding wall. In the second home office, there’s a large sideboard that sits below colorful artwork, while a couch provides a comfortable place to relax. 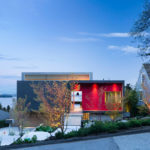 The main floor of the home opens up to the backyard with a swimming pool and outdoor kitchen. 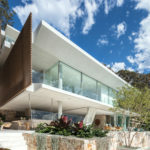 From this angle, you can also see the cantilevered guest suite, that’s clad in cedar and aluminum. Here’s a glimpse of what the guest suite looks like from the inside. 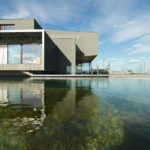 The floor-to-ceiling windows provide a view of the top floor of the main house, and the pool below. Back inside the main house, and there’s multiple sets of stairs that connect the various floors of the home. 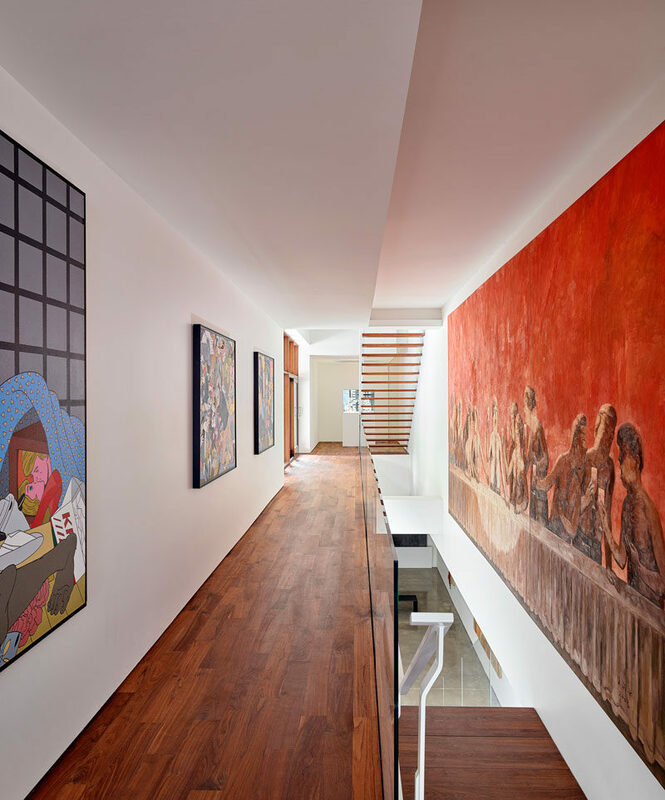 The hallways and walls throughout the home are filled with art pieces. 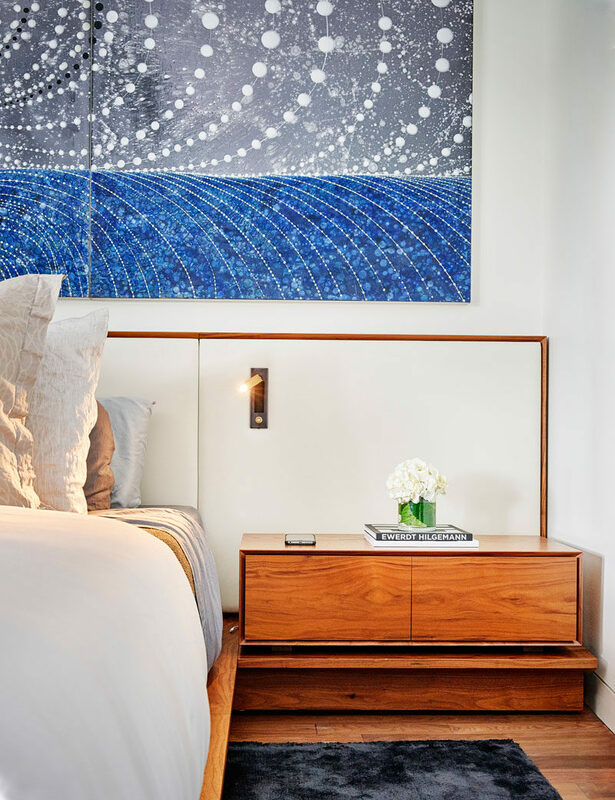 In the master bedroom, wood bedside tables are included as part of the wood bed frame. In the master bathroom, there’s a freestanding bathtub that’s positioned in front of the window, a double sink vanity, and a second vanity area with space for a stool. 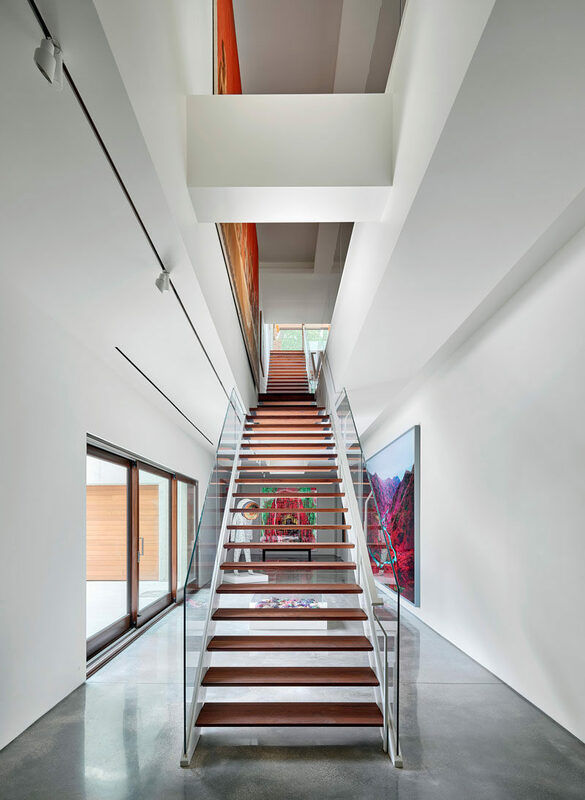 Here’s another look at some of the stairs in the house. 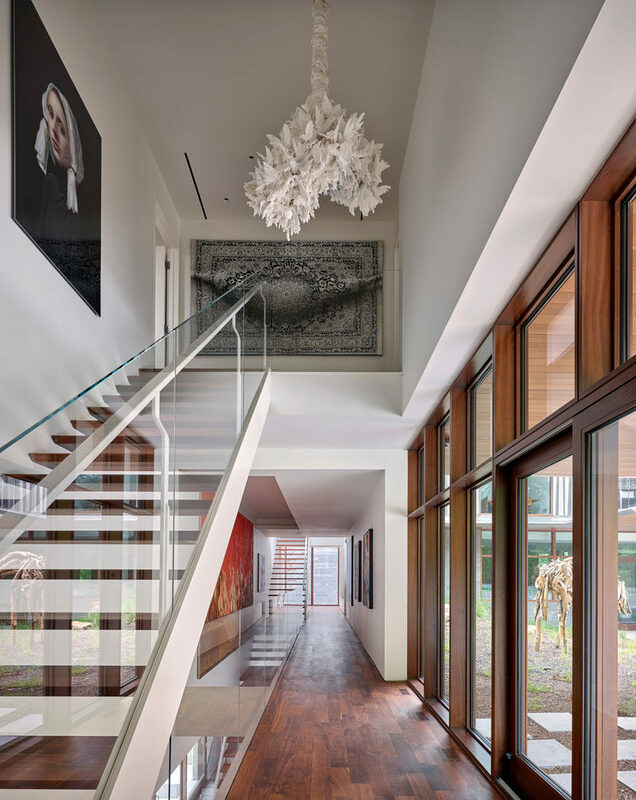 Double-height atriums connect the gallery and living spaces, and these art-laden circulation paths become the “arteries” that bestowed the residence’s name. 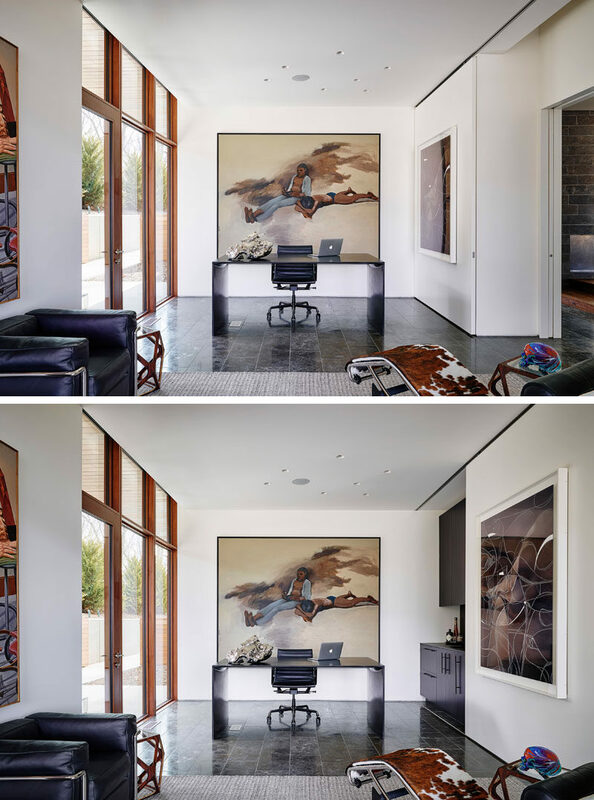 The home also features a sub-grade gallery space that houses paintings, photography, and sculpture, spanning 20 years of collecting, with specific lighting and climate control for the preservation and display of such works. 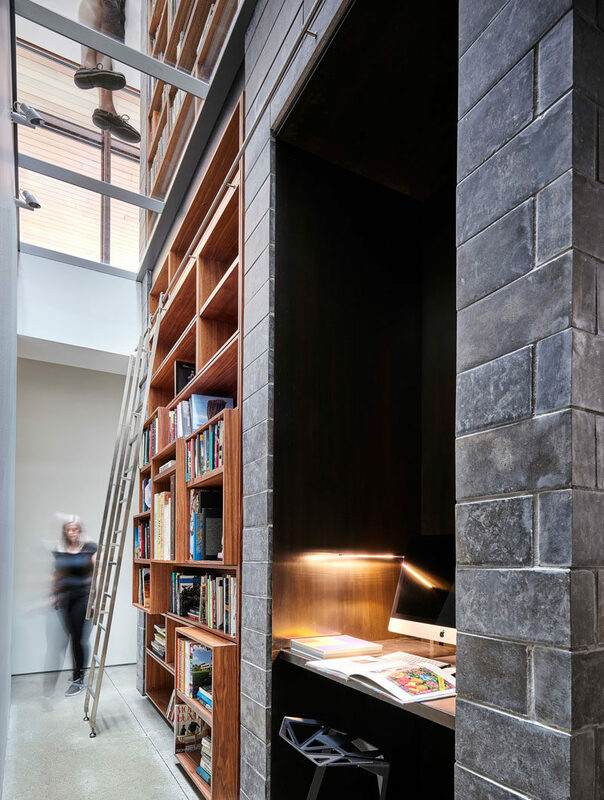 At the end of the art gallery is a library with a built-in wood bookshelf, and an alcove with a desk and computer. Also on this level of the home is a wine cellar. 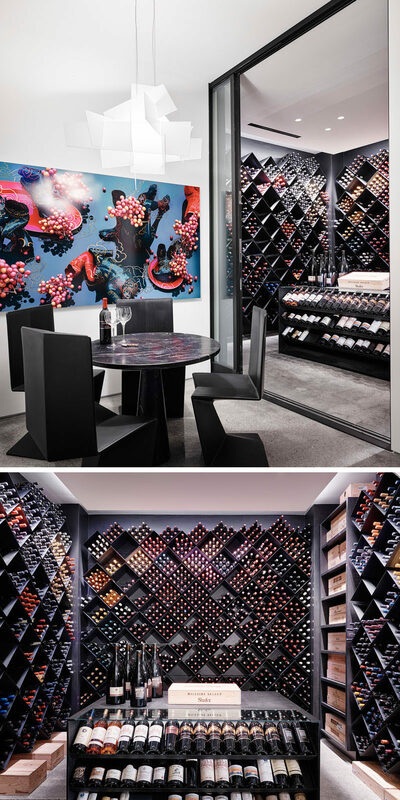 A sliding glass door opens to an extensive wine collection that’s housed within diamond-shaped shelving, while an island provides a place to display selected bottles.